The weather is getting kinder, and the evenings lighter as a bitter winter comes to a close. As the seasons change, our bodies require a different diet and lifestyle to stay balanced. Mind-body awareness techniques, such as yoga, help us to naturally want to make such changes. 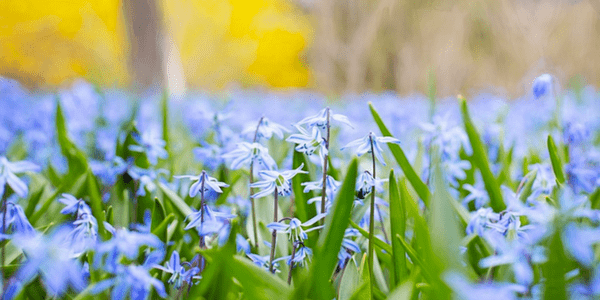 Spring is a time of increased warmth and wetness. Winter is predominantly a cold, damp season which causes Kapha dosha to accumulate (earth and water elements). Now is the ideal time to reduce this build up of Kapha (such as excess weight gain) to prevent feelings of sluggishness, as well as other Kapha related problems such as a sluggish feeling, spring colds and hay fever. – Set your alarm for 7am at the latest, preferably earlier as sleeping later will further aggravate Kapha. Massage your body with warm sesame or sunflower oil, followed by a warm shower. Dry skin brushing is excellent for stimulating lymph and reducing cellulite. Use firm sweeping strokes towards the heart to aid the elimination of fluid. Saunas can be useful for drying up excess secretions. – Practise vigorous exercise to get the lymph moving in the body, preventing congestive problems. It is also one of the best ways to stimulate a sluggish digestion and aid detoxification. See below for specific yoga recommendations for this time of year. – A spring Ayurvedic diet recommends more bitter tastes (e.g. 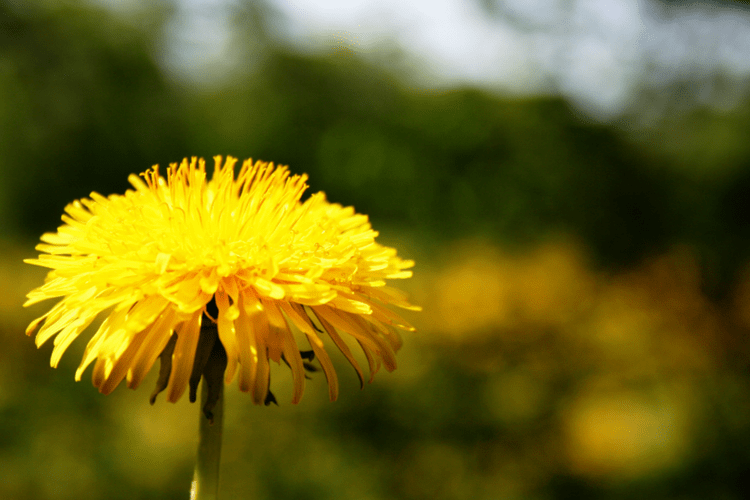 herbs such as dandelion), as well as spicy (e.g. fresh ginger herbal tea) and astringent (e.g. all pulses). These tastes open the channels of elimination, clearing excess mucus and moisture from the body. Reduce Kapha aggravating sweet, sour and salty foods which could cause water retention at this time. In common with the winter diet, minimise raw and cold foods, favouring warm, lightly cooked meals. Lighter grains such as quinoa, millet and barley are all Kapha reducing, but minimise wheat dominant foods. – Use a Neti pot to give the nose a daily rinse with warm, salt water over a sink. This not only helps ward off colds and hayfever but will also improve your pranayama. Read David Frawley’s ‘Neti: Healing Secrets of Yoga and Ayurveda’ which includes information on adding herbs to your Neti pot to aid detoxification. – For a spring cold help clear mucous by eating light, warm, simple foods as you rest. Soup is ideal. Avoid dairy products, sweets, fried foods and yeasted bread which increase congestion. Fresh ginger tea is excellent, especially with raw honey added once the tea has cooled down. Raw honey clears mucous and Kapha due to its heating, drying and channel clearing effect. It is the best sweetener for Kapha types and is good for all in spring. – Herbal help. 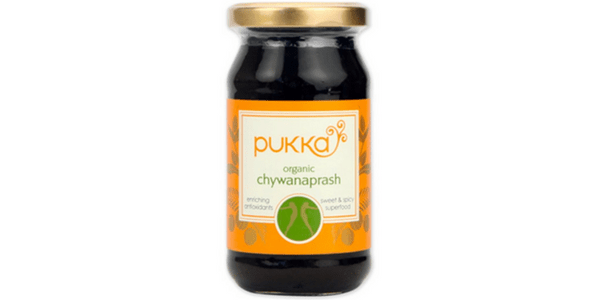 Chywanprash is a delicious Ayurvedic herbal jam (we like ones from Pukka Herbs) to boost immunity and strengthening the lungs (you can try it on toast for breakfast). For persistent colds, try Trikatu (ginger, black pepper and long pepper) which dries up mucous and clears channels. It should not be taken in pregnancy or with aggravated Pitta (e.g. heartburn or hyperacidity). Use copious turmeric and black pepper in your cooking. Turmeric has antiviral and antibacterial properties and can be used in medicinal doses for all respiratory tract infections. Pepper enhances its effect. 1. In a nutshell, make your yoga practice dynamic and stimulating. 2. Faster sun salutations or other vinyasa flow sequence are ideal as they build up body heat, working all the major muscles. Opening the chest area is especially good for shifting sluggish Kapha. Best time is Kapha Kala, between 6-10am. 3. Lion pose or sitting poses with warming pranayama (right nostril or solar breath) to prevent daydreaming. Kappalabhati pranayama is also good for generating internal heat and burning toxins. 4. Warrior poses which open the chest, and Ardha Chandrasana (Half Moon). 5. Down dog, Up dog (and all poses which again open the chest reduce congestion and aid breathing). 6. Inverted balancing poses like handstand, peacock, headstand and Shoulderstand, bridge and plough (excellent for opening lungs) and their variations. 7. All backbends, especially camel pose and bow pose (stimulates digestion). Less emphasis on forward bending as it contracts the chest. Written by Jojo Webber, Director of www.ayurvedicyogi.com – Ayurvedic practitioner and yoga teacher. Check out our calendar for Ayurvedic retreats here.